Back in East Lansing and there’s a little bit of nostalgia this weekend. I had to be in town a couple days, so I went looking for the cheapest hotel I could find. Usually, the two Red Roof Inn’s are the cheapest and recently, I’ve been staying out in Delta Township because it’s five bucks cheaper. This weekend, however, I decided to stay at the East Lansing Red Roof Inn. I say there’s a little bit of nostalgia because two years ago, J and I made a frantic, last-minute trip to Lansing to find a place to live. We had been in Bristol, TN for the Nextel Cup Race the weekend before. She got the phone call on Tuesday that she had been hired in Lansing. We were at her parents in Chicago because we didn’t have to be back to work in Peoria until Thursday. We packed up the car again on Tuesday and drove to Lansing to find a place to live. We only had a week and a half to make the move. We had stayed in a Red Roof Inn in Johnson City, TN and were happy with it, so we found one in Lansing and we spent our first night in what would become our new home at the Red Roof Inn on Dunkel Road. This recent trip was the first time I had stayed at that hotel since that first night. We were given a pretty long lunch break, so I decided to go check in and drop my stuff off. Before that, I wanted to grab a sandwich or something somewhere so I could eat while watching ESPN in my room. I couldn’t really think of much other than fast food chains along Jolly Road so I started driving towards Okemos. 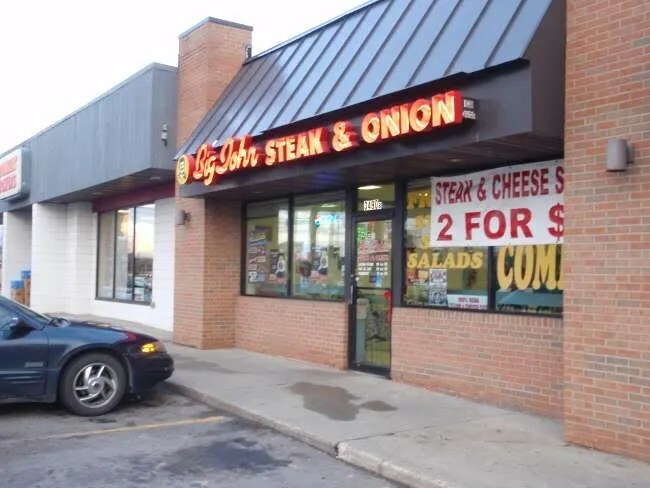 For a long time now, I’ve wanted to see what Big John Steak & Onion was all about. I would never take J there because she’s not a big steak fan. When we lived in Lansing, I didn’t do much dining out on my own, so I never really had a chance. 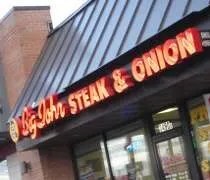 Big John Steak & Onion is a small regional chain with most of its stores in the Flint area. There are three in the Lansing area. I chose the one in Okemos on Okemos Road near the I-96 interchange. The store is in a building connected to a BP gas station, but it’s a separate space. You can’t walk between the two businesses. The space is a typical quick service set up. There are tables as you walk in and even a small counter facing the window. On one side of the room is the kitchen and order counter. I had never eaten at Big John before so I really had no idea what to expect. I scanned the menu pretty quickly, but they had signs all over for a special they had going. It’s hard to pass up two Original Steak subs for $5….I didn’t pass it up. I did keep the onions off though. I hate onions and I know that’s probably blasphemous since they have “onion” in the name of the restaurant. To make up for the lack of onions, I added jalapenos. The cook took out a handful of thinly sliced ribeye steak and threw it on the grill. They kind of give it a Philly cheese steak treatment and cut it up on the flat top. I didn’t really watch as they put my sandwich together, but I do know the meat came right off the flat top and on to a bun. The jalapenos were added and they were wrapped up and handed to me with a cup of Big John Red Sauce in a small plastic cup. I headed back to my hotel and ripped the sandwiches open. They resembled a Chicago-style Italian beef, but they weren’t wet or seasoned anything like that sandwich. The meat was good and it was tender, but there wasn’t a strong unique flavor. There were quite a few jalapenos which added a lot of flavor…and heat, to the sandwich. Two sandwiches for five bucks is a great deal. If you’re a big eater like I am, two sandwiches is enough for a meal. You do get quite a bit of meat on each sandwich, so that’s a good thing too. There’s just not a deep or complex flavor to the sandwich. It is what it is. If you want a quick, warm, meaty sub, Big John is your place. I think with Big John’s it depends on which one you go to, some of them are good and some of them are ok. I live in Saginaw and there is one location, I eat there quite a bit if I’m on that side of town, in my opinion it’s the best Big John’s in the chain, the meat is seasoned perfectly. It’s a Philly cheesesteak sub shop and they are a very good place for cheesesteaks. I’ve been eating at big John’s every Sunday after church for about 17 years now. Overall, i think it’s one of the best steak and onion sandwiches in the greater Okemos area. I recently took my son to Big John’s too. He said it was so good. One time i took my daughter there too, she said it tasted like my wife’s steak and onion sandwich. Anyway, everyone should give Big John Steak and Onion sandwiches a shot. For the money you really can’t get a better steak and onion sandwich. 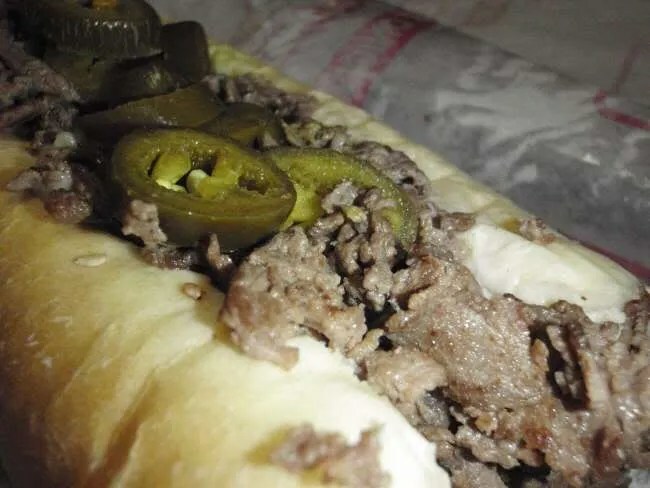 Big John’s Steak & Onion is my favorite sandwich of all time. I can’t imagine eating it without the onions. They aren’t overly powerful and add to the unique flavor that is this sandwich. Another thing that makes these so good is their special red sauce. I can’t even describe anything like it, but combined with the yellow banana peppers, it’s the most heavenly thing ever.